Patients with inflammatory bowel disease (IBD) have an increased risk of developing intestinal cancer. The magnitude of that increased risk as well as how best to mitigate it remain a topic of ongoing investigation in the field. It is important to quantify the risk of colorectal cancer in association with IBD. The reported risk varies widely between studies. This is partly due to the different methodologies used in the studies. Because of the limitations of surveillance strategies based on the detection of dysplasia, advanced endoscopic imaging and techniques involving the detection of alterations in mucosal antigens and genetic abnormalities are being investigated. Development of new biomarkers, predicting future occurrence of colonic neoplasia may lead to more biomarker-based surveillance. There are promising results that may lead to more efficient surveillance in IBD patients and more general acceptance of its use. A multidisciplinary approach, involving in particular endoscopists and pathologists, together with a centralized patient management, could help to optimize treatments and follow-up measures, both of which could help to reduce the IBD-associated cancer risk. Background/Aim: Anastomotic leak after esophagectomy is one of the most challenging complications resulting in a high morbidity and mortality and prolonged hospitalization. The study intended to assess the outcome of endoluminal self-expanding stent in the treatment of this problem. Settings and Design: Department of Thoracic and Cardiovascular Surgery, Arhus University Hospital, Skejby, Arhus, Denmark. A retrospective study. 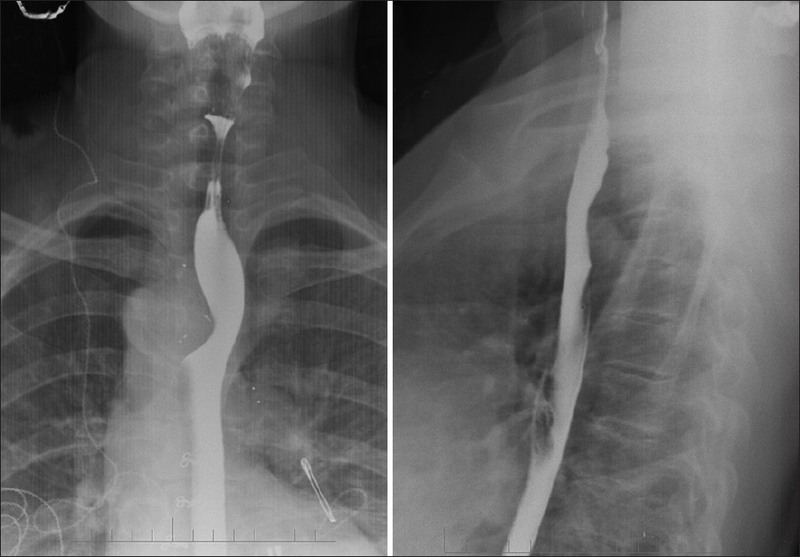 Patients and Methods: From January 2007 to December 2010, 209 patients underwent esophagectomy for malignant disease of the esophagus or the cardia. Twenty patients developed anastomotic leak. Treatment consisted of conservative measures, surgery, and stent placement. 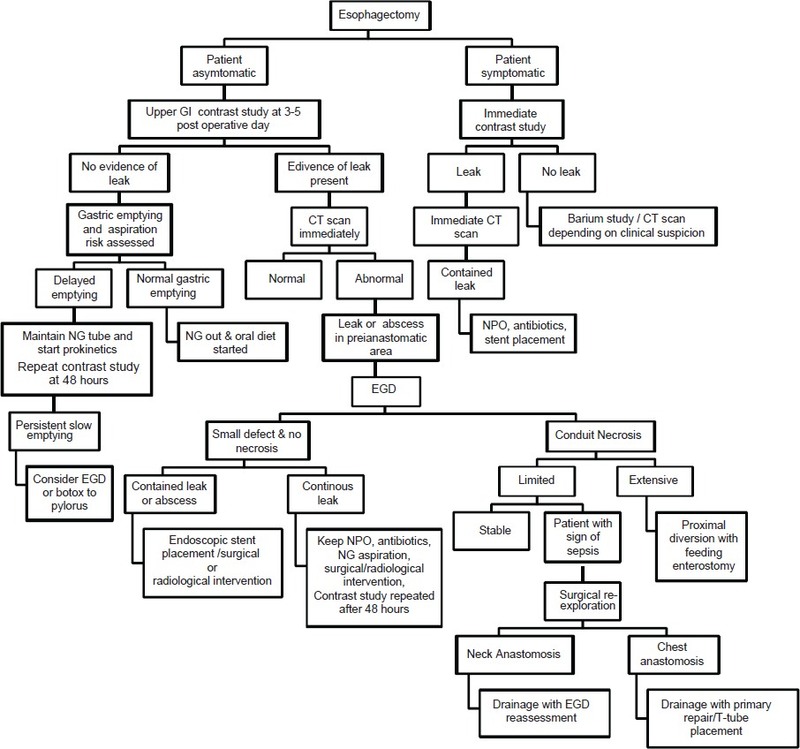 Details of treatment, clinical outcome, complications, and mortality were evaluated. Statistical analysis: None. Results: One hundred and forty-seven patients (70.3%) had carcinoma of the cardia, whereas 62 patients (29.7%) had esophageal carcinoma. Twenty patients (9.5%) developed anastomotic leak; small (<1 cm) in two patients (10%); managed conservatively and bigger than 1 cm in 15 patients (75%); treated with an esophageal stent (Hanaro stent, DIAGMED Healthcare, Thirsk, YO7 3TD, United Kingdom). In three patients (15%), perforation of the staple line of the intrathoracic gastric conduit was found and managed by reoperation. Functional sealing of anastomoses after stent placement could be achieved in 10 patients (67%). Stent-related morbidity developed in five patients (33%): Migration of the stent, n=3 and tracheoesophageal fistula, n=2. 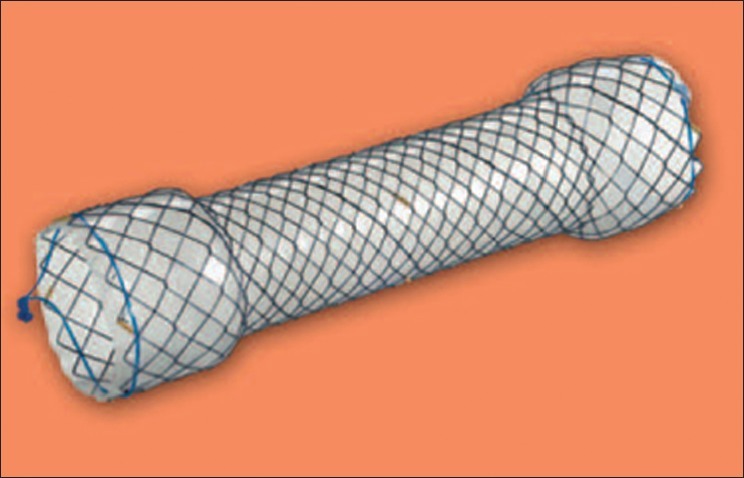 Stents were smoothly removed 3 weeks after discharge. The mean hospital stay was 25 days. There was only one stent-related death (6.6%). Conclusion: Endoluminal stent implantation is an effective and safe option in the management of postesophagectomy leaks. Background/Aims: Pneumatic dilatation (PD) is one of the effective treatments of achalasia. 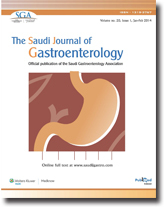 The aim of this study was to evaluate the efficacy of pneumatic dilation and patient satisfaction in Saudi achalasia patients. Patients and Methods: We have retrospectively recruited patients with confirmed achalasia, who underwent at least one dilatation session from January 1990 to January 2010 at a single tertiary center. Symptoms, including weight loss, dysphagia, retrosternal pain, and regurgitation, were assessed with the use of the Eckardt score (which ranges from 0 to 12, with higher scores indicating more pronounced symptoms). All patients were called and asked about their Eckardt score in addition to their satisfaction score post the dilatation procedure. The primary outcome was therapeutic success (Eckardt score ≤ 3) and patient satisfaction at the time of their calls. The secondary outcomes included the need for retreatment and the rate of complications. Results: A total of 29 patients were included, with a mean age of 40.30 (95% CI: 36.1-44.6) and 55.2% of them were males. The mean of the pre-dilatation Eckardt score was 8.3 (95% CI: 7.2-9.4), which dropped to 2.59 (95% CI: 1.7-3.5) after PD (P < 0.01) with a clinical remission of 76.7% after the first dilatation and a total failure in two patients (7%) after the third dilatation. The mean number of dilatations was 1.3 (95% CI: 1.1-1.5) where 50.7% required one dilatation, 19.2% required two dilatations, and 30.1% required three dilatations. The mean of the symptoms-free period was 53.4 months (SD 52.7, range 1-180) with symptoms recurring in 35% of patients within 2 years. The mean of post-PD patient satisfaction was 7.45 (95% CI: 6.2-8.7). Perforation, which was treated conservatively, occurred in one patient (3.5%), whereas bleeding occurred in two patients (7%). Age or gender was not found to be a predictor of Eckardt score improvement on multivariate linear regression analysis. 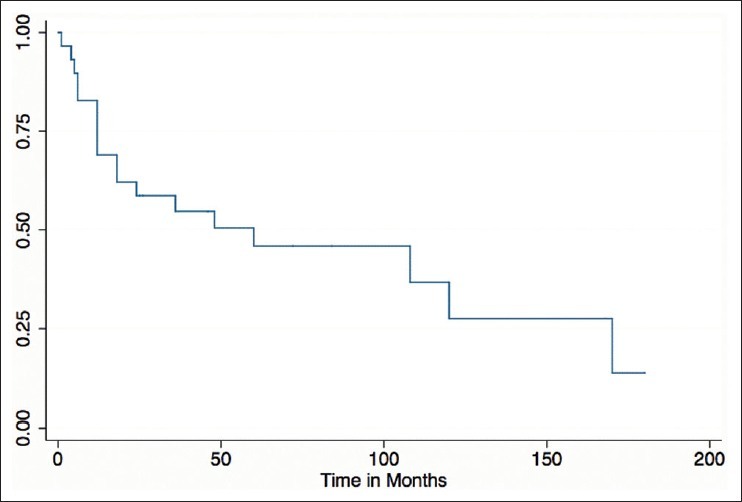 Conclusion: PD is an efficacious procedure in Saudi achalasia patients with a very good overall patient satisfaction with 53.4 months of symptoms-free period after a successful dilatation. Background/Aims: Recent studies have revealed that Glasgow prognostic score (GPS), an inflammation-based prognostic score, is inversely related to prognosis in a variety of cancers; high levels of GPS is associated with poor prognosis. However, few studies regarding GPS in esophageal cancer (EC) are available. The aim of this study was to determine whether the GPS is useful for predicting cancer-specific survival (CSS) of patients for esophageal squamous cell carcinoma (ESCC). Patients and Methods: The GPS was calculated on the basis of admission data as follows: Patients with elevated C-reactive protein (CRP) level (>10 mg/L) and hypoalbuminemia (<35 g/L) were assigned to GPS2. Patients with one or no abnormal value were assigned to GPS1 or GPS0, respectively. Results: Our study showed that GPS was associated with tumor size, depth of invasion, and nodal metastasis (P < 0.001). 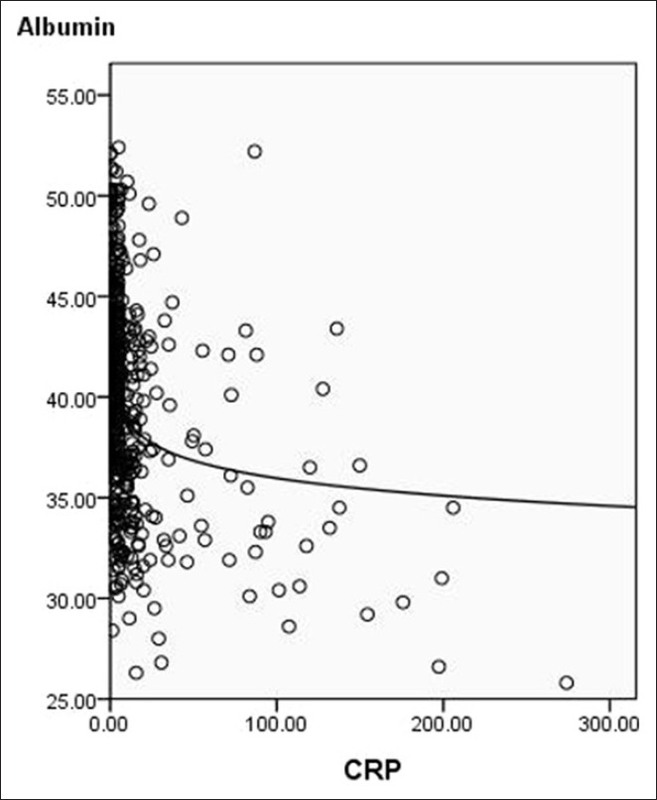 In addition, there was a negative correlation between the serum CRP and albumin (r = −0.412, P < 0.001). The 5-year CSS in patients with GPS0, GPS1, and GPS2 were 60.8%, 34.7% and 10.7%, respectively (P < 0.001). Multivariate analysis showed that GPS was a significant predictor of CSS. GPS1-2 had a hazard ratio (HR) of 2.399 [95% confidence interval (CI): 1.805-3.190] for 1-year CSS (P < 0.001) and 1.907 (95% CI: 1.608-2.262) for 5-year CSS (P < 0.001). Conclusion: High levels of GPS is associated with tumor progression. GPS can be considered as an independent prognostic factor in patients who underwent esophagectomy for ESCC. Background/Aim: Previous studies have shown the association of some genetic factors, such as Plasminogen activator inhibitor type-1 (PAI-1) 4G/5G polymorphism, with the development of inflammatory bowel disease (IBD). We aimed to study this polymorphism as a risk factor in IBD patients in this cohort. Patients and Methods: One hundred and fifteen IBD patients and 95 healthy controls were selected from Iranian Azeri Turks and -6754G/5G polymorphism of PAI-1 gene was tested by polymerase chain reaction using allele-specific primers confirmed by sequencing. Results: There was no significant difference of PAI-1 polymorphism between IBD patients and the control group (P > 0.05). Furthermore, these data showed no significant difference between Crohn's disease and ulcerative colitis patients. However, 4G/4G homozygotes have reduced probability to progression of loss of appetite, whereas 5G/5G genotypes have increased risk for development of chronic diarrhea without blood, nausea, and loss of appetite. Conclusions: Although our study showed no significant association of PAI-1 polymorphism between patients and control group, the carriers of 4G/4G genotype and 4G allele had reduced risk for the progression of IBD features in this cohort. Background/Aims: COX-2 and TGF-β1 are overexpressed in hepatitis C virus (HCV) infection and are related to hepatitis pathogenesis and hepatic fibrosis. The current study investigated the relationship between pretreatment COX-2 and TGF-β1 hepatic expression in HCV genotype 4 and the virological response to interferon therapy. 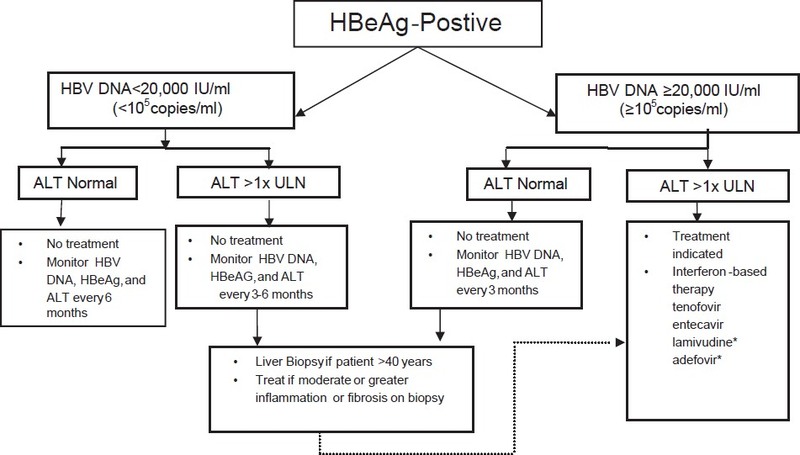 Patients and Methods: Liver biopsies of 55 patients with HCV infection genotype 4 were selected together with 10 liver biopsies as control. The patients' clinicopathological data were collected. 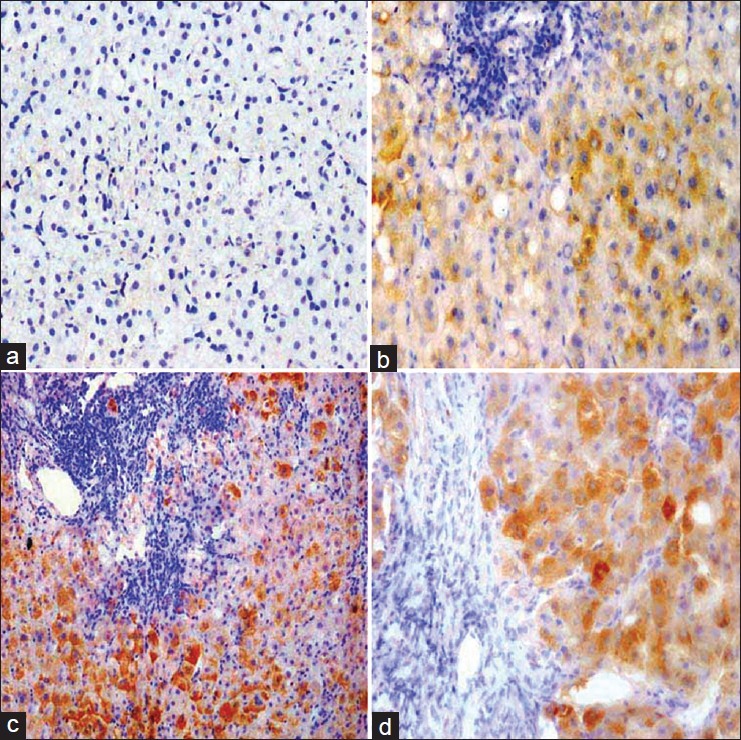 Immunohistochemistry was done using anti-COX-2 and anti-TGF-β1 antibodies. Statistical tests were used to determine the association between both COX-2 and TGF-β1 expression in relation to clinicopathological parameters and response to interferon therapy. Results: COX-2 was upregulated especially in nonresponders and was an independent predictor of poor virological response. However, COX-2 showed no association with other clinicopathological features. TGF-β1 was upregulated and associated with nonresponders, histological activity, and fibrosis stage. There was no association between TGF-β1 and other clinicopathological features. There was an association between COX-2 and TGF-β1 immunoexpression. Conclusion: Overexpression of COX-2 and TGF-β1 is an independent predictor for poor outcome of interferon and ribavirin therapy and these might be useful markers for the response to treatment. Both molecules are associated together; however, their role during hepatitis treatment has to be clarified. Background/Aim: To compare lipoprotein and malondialdehyde levels and paraoxonase-1 activity between subjects with asymptomatic cholelithiasis and controls. Patients and Methods: Eighty subjects with asymptomatic cholelithiasis (55 women, 25 men, mean age: 51, SD 14 years) and 40 control subjects without cholelithiasis (25 women, 25 men, mean age: 51, SD 12 years) were enrolled to the study. Serum paraoxonase activity, lipoproteins, and malondialdehyde were measured. Results: In the cholelithiasis group, serum total cholesterol, low-density lipoprotein cholesterol, and malondialdehyde were significantly higher and high-density lipoprotein cholesterol (HDL-C) and paraoxonase-1 were significantly lower than the controls. In cholelithiasis patients with serum glucose level > 100 mg/dL, body mass index, serum total cholesterol, triglyceride (TG), and malondialdehyde levels were significantly higher than cholelithiasis patients with serum glucose level < 100 mg/dL. Paraoxonase-1 activity was significantly lower in patients with serum glucose level > 100 mg/dL. In cholelithiasis patients with TG > 150 mg/dL, mean age, body mass index, glucose, total cholesterol, and malondialdehyde were significantly higher than in cholelithiasis patients with TG < 150 mg/dL. In cholelithiasis subgroup with TG > 150 mg/dL, HDL-C level and paraoxonase-1 activity were lower than in the cholelithiasis subgroup with TG < 150 mg/dL. All of the above comparisons were statistically significant (P < 0.05). Conclusions: Patients with asymptomatic cholelithiasis have evidence of increased lipid peroxidation and decreased antioxidant capacity. Patients with asymptomatic cholelithiasis with components of the metabolic syndrome have more lipid peroxidation and less antioxidant capacity than patients with asymptomatic cholelithiasis but without the components of the metabolic syndrome.